Detecto Stretcher Scale is ideal for emergency arrivals into a hospital when time is of the essence for gathering patient weights. The model 8500 can be used in the ER, dialysis, long-term care, and nursing homes. The model 8500 is 115 lb net weight and the slim profile scale design fits easily through doorways of nearly any size. Detecto Stretcher Scale is ideal for emergency arrivals into a hospital when time is of the essence for gathering patient weights. The DETECTO model 8500 can be used in the ER, dialysis, long-term care, and nursing homes. The spacious 60 in W x 32.5 in D/1,524 mm W x 826 mm D platform size accommodates all common stretcher types. 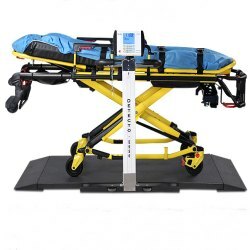 DETECTO’s Stretcher Scale® is engineered and manufactured at a light enough weight that it is easily portable to lift up and roll by nursing professionals. The model 8500 is 115 lb/52 kg net weight and the slim profile scale design fits easily through doorways of nearly any size. The scale’s relatively low net weight, wheels, and guide handles all combine to make it easy to maneuver. The Stretcher Scale® offers precision weighing for patients in stretchers, gurneys, or wheelchairs. The steel construction provides optimal durability that is built to last. The MedVue® indicator’s Hold/Release key can hold the patient’s weight after leaving the scale for better patient care. The scale features a 800 lb x 0.2 lb/360 kg x 0.1 kg capacity with clinical-grade accuracy. It is mobile for use in multiple clinical departments. 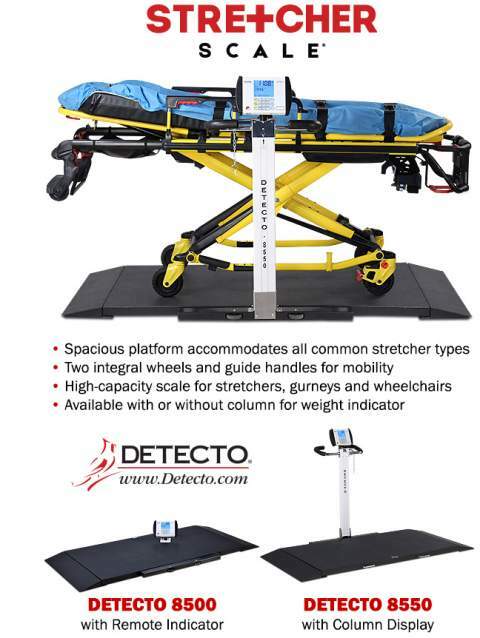 DETECTO’s Stretcher Scale® has a 2-inch-high, low-profile platform with textured mat surface. The two-way-access ramps rest on the floor making it easy to roll patients onto the scale platform. The single-pass weighing feature saves time by allowing you to enter the stretcher or wheelchair tare weight using the numeric keypad on the indicator. You may also use the convenient pushbutton tare feature to remove the stretcher or wheelchair weight if you don’t know the weight already. The model 8500 comes with a wall or desk mount swivel bracket for the MedVue® weight indicator. An optional yellow guide rail kit is available for the 8500/8550 (8500-GUIDERAILS).